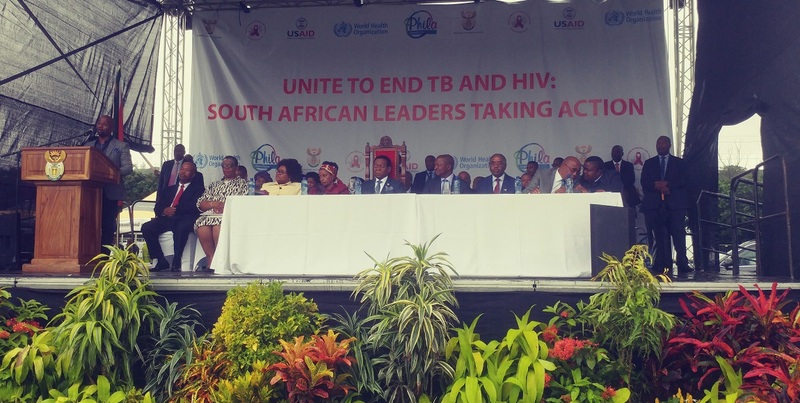 On Thursday thousands braved inclement weather and gathered at the Cato Manor sports ground to be addressed by deputy president David Mabuza and Zulu King Goodwill Zwelithini in commemoration of World TB Day. Speaking in his first official visit to the province as the deputy president, Mabuza urged people to end the epidemic by taking an initiative for their health and go get tested at nearby clinics. â€œIt is worrisome that TB still causes so much pain and suffering in our country when it is curable,â€ he said. Mabuza was speaking as part of the dignitaries that flocked Cato Manor for an engagement between the King Goodwill Zwelithini, health minister Aaron Motsoaledi, and traditional leaders. The monarch pointed out that one of the reason TB is still a prevalent deadly disease was a result of how people behaved. â€œWe need to teach people to stop treating alcohol consumption as fashion. We also appeal to drug kingpins to stop exploiting our children,â€ he said. According to the South African National Tuberculosis Association (Santa), South Africa has the most serious TB epidemic globally and it is the leading cause of death, with males being the most affected group. KwaZulu-Natal is considered to be the leading province with TB infection, â€œThe eThekwini District alone has reported more than 700 per 100 000 population of TB notification reporting race,â€ said eThekwini Mayor Zandile Gumede. According to Mabuza, South Africa will be launching a national campaign aimed at testing and treating at least an additional 80 000 people with TB between April 2018 and March 2019.
â€œThe campaign is targeting people who are currently not diagnosed or have stopped TB treatment before they were cured,â€ Mabuza said. He said that people were dying of TB because of stigma associated with TB and HIV/AIDS. â€œPeople die alone and silently fearing the burden of being shamed and discriminated,â€ he said. In September this year, the United Nations will be hosting a high level meeting on TB in New York in which head of states and governments will be looking at how the world will eliminate TB.